Something exciting happened to me this weekend – I met Lady Florence Bjelke-Petersen! We were staying at the lovely Bethany Cottages in Kingaroy, and were invited to the house for Lady Flo’s famous pumpkin scones. The scones were every bit as tasty as I’d hoped, but meeting Lady Flo was by far the highlight of our trip! Although she’s now in her nineties, Lady Flo still has all the hallmarks of the matriarch that Queensland admires. It was a real thrill to meet her. What a woman – Writer, Senator, Farmer, Mother, Wife and a damn fine cook! Before we left town, I found a copy of Lady Flo’s Classic Country Collection – a cookbook of over 500 recipes and handy hints for classic Australian fare. I look forward to test-driving more of these on the blog. Add egg, then pumpkin. Finally stir in the sifted flour by hand. Early morning view from Bethany Cottages – Kingaroy bathed in fog. Bethany Cottages were a great spot for our family get away – we rented all four cottages to house all of Bearhands’s family and really enjoyed our two nights there. You can also do a tour of Bethany, complete with tea and pumpkin scones. Details are on their website – Bethany Cottages. For those of you not au fait with Australia history. Lady Flo is as close to royalty as Queensland offers. A retired politician and writer, she was a member of the Senate from 1981 to 1993. But Lady Flo is most fondly remembered as the wife of the longest-serving Premier of Queensland, the late Sir Joh Bjelke-Petersen (13/01/1911 – 23/04/2005). have you ever tried Lady Flo’s Pumpkin Scones? Gotta love a pumpkin scone. Without incriminating myself too much, I work somewhere that Joh and Flo used to hang around a lot back in the day. It’s a big old building at the end of George Street. You know. Ahem. Anyway legend has it they still use that recipe for the punkin scones at the cafeteria. The legend lives on. Haha. Sarah, she was incredible. She even told us a story about brokering a deal between Joh and some miners by inviting them to meet halfway for a scone! I’m not much of an Australian having never tried a pumpkin scone but these sound just perfect! What a treat to meet lady Flo as well! 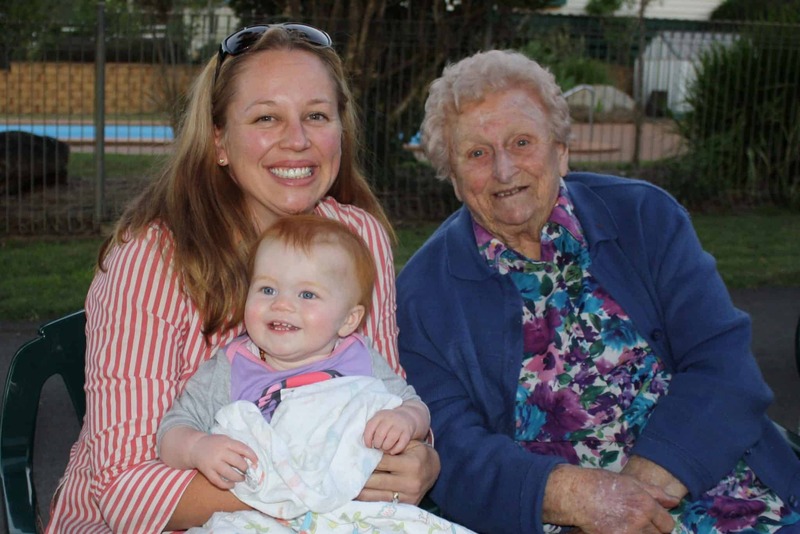 Sprightly is totally the word for it Rachel – when the afternoon finished up, she excused herself to go and put the veggies on – for her great-grand children. Love pumpkin scones! With lots of butter. And the best bit, the girls are suspicious of them – the colour or perhaps the mention of a vegetable – which means that Justin and I have them all to ourselves! My kids don’t refuse them, but they have been known to lick the good bits off the top and hand them back! Oh, that’s a lovely photo and story. I worked at Queensland Museum for awhile and one of the collection items in the store room was a recipe for scones handwritten by Lady Flo – surprising how much of a kick different visitors got out of it! No matter how controversial her husband was people still have such a soft spot for the scones! Awww pumpkin scones.. brings back memories of my grandma who used to make the most AMAZING ones for my lunchbox. What I’d like to know is, who was the person who looked at a pumpkin and thought, ‘hmm, you look like you want to throw yourself into my scones today’. Crazy bakers. What would we do without them? They probably had kids like mine who swerved their attempts at mashed pumpkin Kim! Totally Queensland royalty and deservedly so! Pumpkin scones don’t seem to taste any different than plain scones to me. Maybe Lady Flo’s scones would be the exception. Sounds like a lovely weekend – 12000 miles is a little far for me to travel but I may well try these at home! Such a coincidence I saw Lady Flo’s recipe on a Tea towel today -almost bought it but I’m the only pumpkin scone eater. I’m glad you like the scones. I’m no Lady Flo, but not all pumpkin is the same. Butternut pumpkin for example has a higher water content than other varieties. Perhaps excess liquid in the pumpkin mash is making your scone dough sticky? Maybe try a different variety of pumpkin or using some cheesecloth to squeeze some of the water out of your pumpkin mash before you add it?